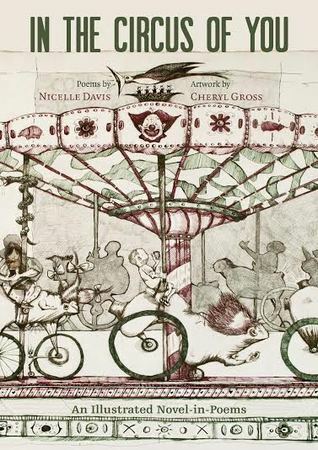 I look forward to reading this beautiful book over and over: I want to revisit its gorgeous images, both those created by illustrator Cheryl Gross and poet Nicelle Davis, who has created an exquisitely textured world of animals and their bones, circuses and the folk who staff them, pain and the rupture points that bring it. This work is so vital, with every snap of a line break bringing a small moment of fresh joy. This is the kind of book that continues to offer more with every reading--I look forward to the next! This book was difficult to put down. What a work of dark art! I was on fire after reading the first poem, “I Drive Our Son around Every Day at Noon.” Nicelle garners empathy for her subjects through honest, grotesquely human imagery : “His chest rising, collapsing, in time with bird wings.” The artwork by Gross serves a twisted reminder of our own afflictions – we ALL hide them well but this book exposes them for the true circus – gives poverty a dingy, contorted visual and our anxiety a gnarled truth. Full review coming soon to http://alt-current.blogspot.com. As a lover of experimental form, I'm always looking for clever and fresh ways to tell a story, and I was thrilled to see how Nicelle Davis does it here. In the Circus of You is a book of poetry, yes, but it's also a complete story. Each poem stands beautifully on its on, but at the same time you can step back and see a story arc, and even more importantly to me, a character arc. These poems engaged me right from the start, connected me to the narrator, I'm invested, and by the end I feel I know this person. And the illustrations by Cheryl Gross are the icing on the cake. It's really a beautiful collaboration between the author and the illustrator. Like all the books put it out by Rose Metal Press, this one has become a favorite. It's one that I carry with me, and I'm constantly going back to it. Highly recommend this book to all my writer friends, especially those of you who enjoy experimental form. *FTC Disclosure: I received this book free from the publisher in exchange for my honest review. It's hard to put my finger on exactly what I didn't like about this book, but I think perhaps there was a general feeling that it could have been/done more. The poems stay very true to theme, but as such become very repetitive, with recurring images and references doing more to bring me out of poems than into them. The individual poems are not to my taste, but they're certainly highly emotive and evocative; their impact is dulled by repetition, however. The 8th reference to a pig's head or a pigeon's nest or a necklace of string and bones gets a bit tired. There's a story element here, yes, but there was a loss of power in there somewhere. I'd absolutely love to see more poetry books make use of correlative artwork, though. It's something that I don't think has been adequately explored. Imagine a visual manifestation of an Ack mutating and replicating into carousel animals that strain to reach each other’s tails. Imagine all the stages of evolution that occur in utero reversing and pirouetting and giving each other the finger. Imagine the sideshow inside yourself.Poet Nicelle David and Cheryl Gross have constructed a marvel of a book. They call it “An Illustrated Novel-in-Poems,” but some books are so defiant, they won’t be kept to genre labels. I expect to read this one like Gabriel Betteredge does Robinson Crusoe in Wilkie Collins' The Moonstone (or as many folks do the Bible) for years to come. Close eyes, open book, point to random spot on page, open eyes, discover endless inspiration. I feel bad giving this an 'ok' review because I'm definitely no expert on poetry so this may be fabulous poetry and I don't know it. That said, my review is based on the fact that, to me, it was only ok. There were a couple of poems on the topic of divorce that resonated me, but for the most part I felt pretty lost and confused. In our Rumpus online chat, the illustrator (who did a great job interpreting these poems) was very interesting and had clear enthusiasm for the project, but it was still only ok for me. This is cool in concept, and actually manages to pull that concept off. I could get into the artwork or the poems individually, but they aren't even really separate the way I saw it. They complement, deepen, and work off of each other. I look at it as a multimedia whole, an imaginative and insightful, as well as unsettling and moving, whole. This is some good stuff. It definitely pushes some form boundaries for me, but clearly isn't doing so as just an exercise to see if it can be done. It works, and it works well. I really debated between 3 and four stars. This book is probably 3.5 for me. But the intro and little piece at the end really made it better for me. The theme of divorce and psychiatric medication did not resonate with me. But the theme of motherhood did. The illustrations are interesting, not necessarily my type but they do add to the "novel" a bit. A few of the poems really resonated with me! Interesting read. I recommend reading it through as one piece not spacing out the separate poems. I got a lot more out of it reading it all together. Nicelle Davis's work is all at once whimsical and gut wrecking. Accessible and imposing, her sparse prose and short poetry is sort of seductive in its set up, but the words themselves are all sorts of heavy.The illustrations are delightful as well. I wish I could give this 4.5 stars. The language at times feels a bit self-indulgent, but aside from that minor criticism, this piece brilliantly illustrates the beauty and grotesqueness of life, family, pain, and the spinning carousel of mental illness. Not my usual style, but it is beautiful and honest. There's a skill at being both at the same time, and Davis and Gross are masters of it.